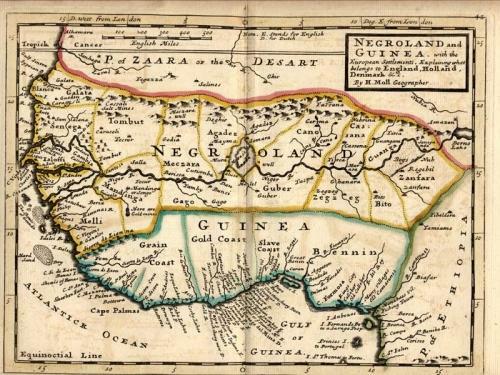 Full title: 'Negroland and Guinea with the European Settlements, Explaining what belongs to England, Holland, Denmark, etc'. By H. Moll Geographer (Printed and sold by T. Bowles next ye Chapter House in St. Pauls Church yard, & I. Bowles at ye Black Horse in Cornhill, 1736?). An attractive and neatly engraved map of west Africa from the Herman Moll Atlas Minor. The map is in four colours showing the area of French Guinea, Sierra Leone, Liberia, Ivory Coast, Gold Coast, Togo, Nigeria, etc. Rivers are named as well as towns and islands.